I thought I would be sad to leave my apartment in the Wangjing compound Yin Ling Guo Ji. I thought I would miss it a lot. However, both while packing up, and now two weeks after moving, I mostly feel thankful. I am thankful for all the things I learned during my nearly 3 years living in Yinling, and thankful for all the memories made there. I suppose this post is my thank you and farewell to my first real home. The biggest thing I learned while living in Yinling was how to build a home. Not a house, not a place to live, but a HOME. I have decided that a home is a place to both house and create memories. It is where you connect all the places and people that make you who you are, collecting those memories in one place. It is where you make new memories to carry with you. I left my parents’ home when I was 21 to move to China for a year. That year turned into 9 (and counting) but I didn’t start out planning to be here anywhere near this long. I had always thought of China as a short-term thing on the way to a normal career and normal life. I first felt my “age” when I turned 27, and realised that if I wanted that “normal” career and life in Australia, I was running out of time to get started. I decided to move back to Australia and started taking steps toward making that happen – only to realise that I didn’t WANT a normal life and career. I wanted to stay in China working with TCKs – that is what excites me! (I wrote about this back in 2010.) 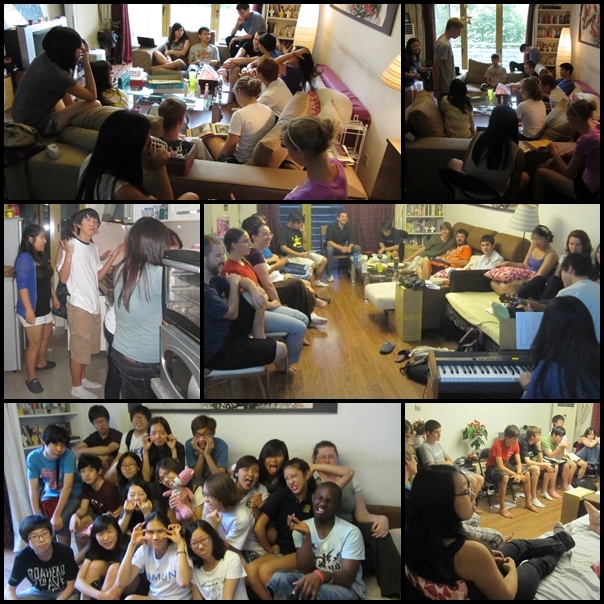 So at the end of that school year, in June 2010, instead of moving to Australia I moved back into the city of Beijing and took a job working with teens at the expat church I was attending (Capital Community). I tell this story because that’s where I was at when I moved into Yinling. After 6.5 years in China I was finally here “to stay”. I was finally settling in for the long haul. While on the outside it seemed logical, and not much of a change, on the inside the change was huge. Instead of making do, I started making a life. I had my stuff shipped over from Australia. I bought things I considered “permanent” – like my Christmas tree, custom-made furniture, and a piano. The difference was astounding! Putting up little keepsakes from my Australian life in my Beijing apartment felt… like coming home. Finally, all the pieces of my life were in one place. At the time I talked about how I no longer felt geographically schizophrenic – my life was centred in one place, no longer scattered in several. The point of this is not to say that Yinling was home, although it was, but rather to say that during my time there I learned how to make a home. I know which objects are important to me feeling at home – like the curtains my Mum made for my bedroom back in Canberra. I’ve discovered that I would rather get rid of many practical things and re-buy them, and hang on to the special things that can’t be replaced. I know that sounds obvious, but to me it was a revelation. It’s those special things that create a home, rather than just filling a house. When I packed to move into my bedroom at the Browns’ house, where I am now, I was careful to choose certain things to make it “home”. I can look around my room here are see reminders of people, places, and times that are important to me. I have so many great memories from Yinling. It’s probably not surprising that most of them revolve around youth ministry. Summer youth group meetings filling my living room with kids from ReGen, Rev and Bongos – the time the cat came out of hiding during prayer time and scared someone into a scream; the time a bunch of kids washed up all the dishes dirtied in making and eating dinner; the time we ordered Chinese food so yummy that people still talk about it. Sleepovers filling my whole house with girls from the youth group – the time a bunch of my girls put me to bed, giving my hugs and kisses and turning out the light on their way back to the living room; the time we built a fort and the light fitting later crashed down in the middle of a movie; the time we painted a huge canvas and repainted it a bunch of time eventually ending up with a big pinkish mess of fingerpainting; converting people to the briliance of bacon and cheese pancakes multiple times. Then there’s all the random times I had kids over – chatting with Jess while curling her hair for the IAB dance; manicures and movies with Natalie; lying on the bed talking about life with Sarah; having my IAB 8th graders over; singing lessons and manicures and hair dye parties with lots of different people. So many memories! 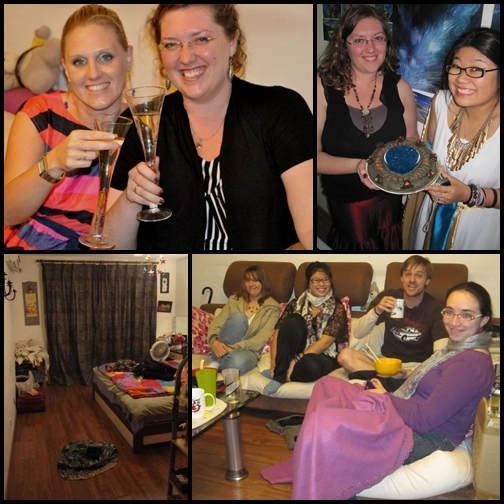 And there were other visitors – the Stargate party; serving many a pavlova; dinner parties with friends; Aussie friends who came to China and stayed with me; 6 different flatmates, and many others who stayed for a short time. Then there was my family’s visit last summer – playing Citadels with my sisters and brothers (in law), and having everyone over for champagne and Oh Hell after my party. Having them there made it even more perfectly home. I think the reason I don’t miss Yinling (although I may feel differently later) is that I know how to reproduce what I had there. No two places are ever the same, but I now know how to turn a place I live into a home. The room I’m staying in now feels like mine because of specific things that fill it. I think the reason I eventually want to live closer to the expat bubble, rather than in the cheaper area a little further out, is that filling my house with people (and making memories together) is part of what makes it home, and I see that happening more if I live near where others do. IM IN A PICTUREEE YAYAYAYAYAYAY!!!!! !